This is only the third time we’ve flown with our Bromptons. 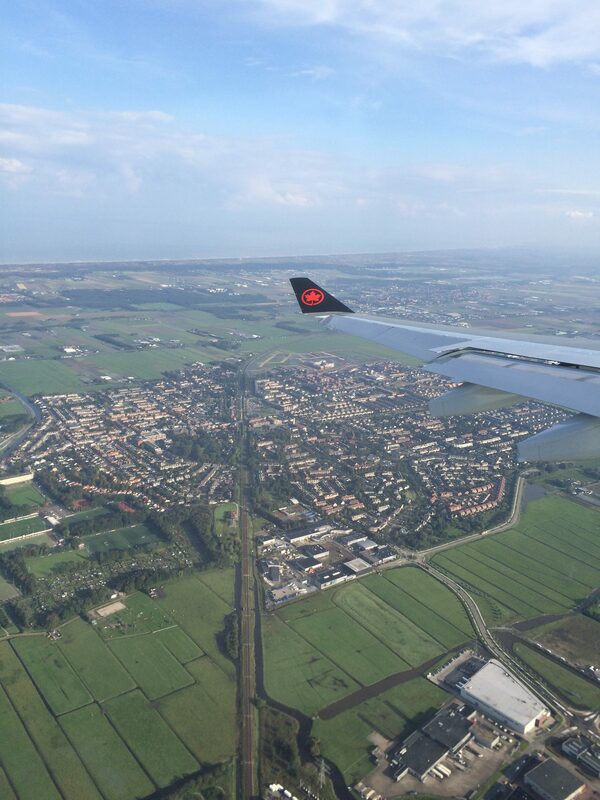 The first time was to Cuba on WestJet, the second was to Washington on Porter Air, and this time we flew to Amsterdam on Air Canada. The night before takeoff we checked in online and when asked if we were traveling with bikes, I clicked ‘yes’ to see what would happen. $100 charge per bike is what happened! Oh hell no. I went back and selected ‘no’ bikes, just regular luggage, because our Bromptons in their B-bags are well within the size and weight restrictions for Air Canada’s checked baggage. At the airport the next day, the employee checking our bags noticed that we had folding bikes inside, but didn’t charge us the bike fee, though he did direct us to put the bags in Oversized. However, he warned us that on our way home we might be charged the fee. It all depended on who was checking in our baggage. Duly noted. 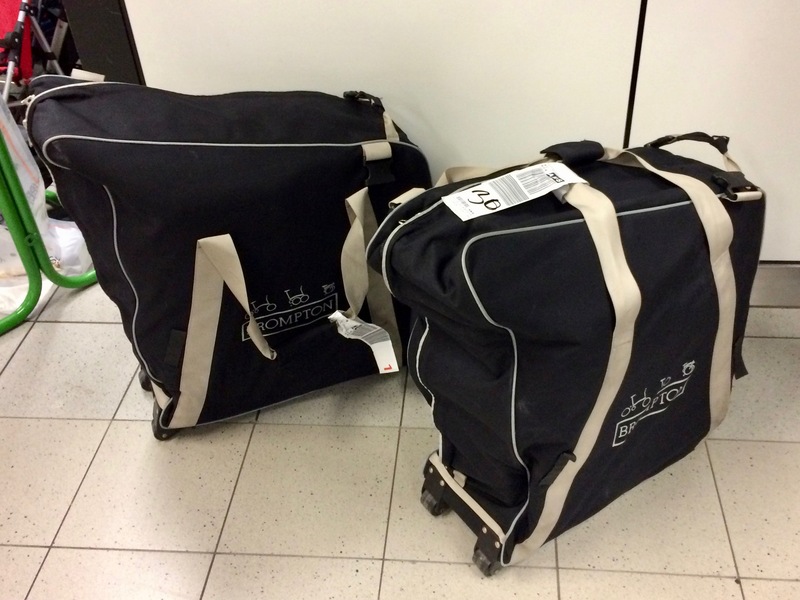 In Amsterdam, we were waiting at the Oversized Luggage spot when we saw our Brompton bags come out with the regular luggage. I guess the baggage handlers decided they didn’t warrant being with the Oversized luggage after all. Brommies arrive safe and sound. Because the B-bags are rather cumbersome to roll, we unpacked and unfolded right there. We’d put cardboard around all the sides just to give the bikes extra protection, and as expected, they were both perfectly fine. I also brought a fancy new mini floor pump. So much easier than using the standard Brompton hand pump. Plus, the new pump has a pressure gauge. That would come in very handy later in the trip. And we were ready to roll! 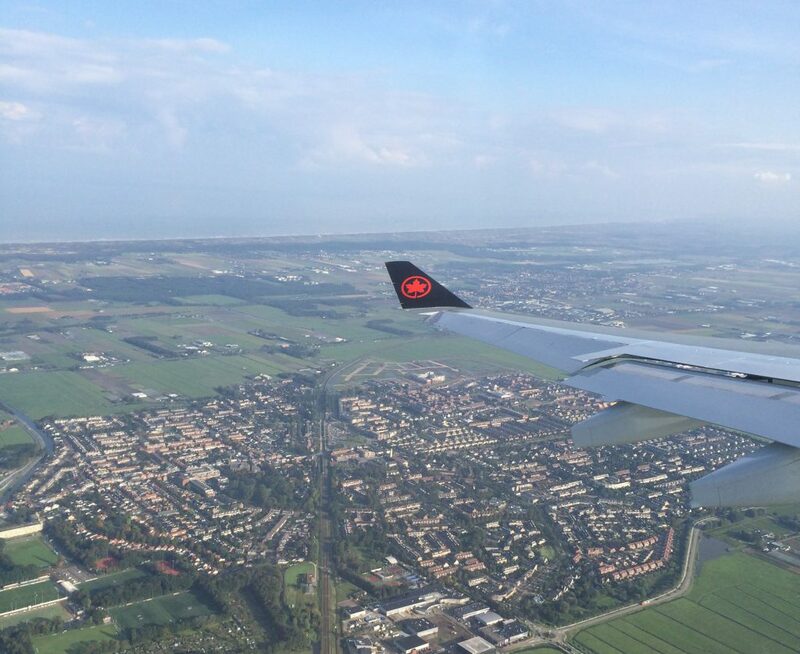 Rolling out of the Schiphol Airport in Amsterdam. But both bikes arrived fine. 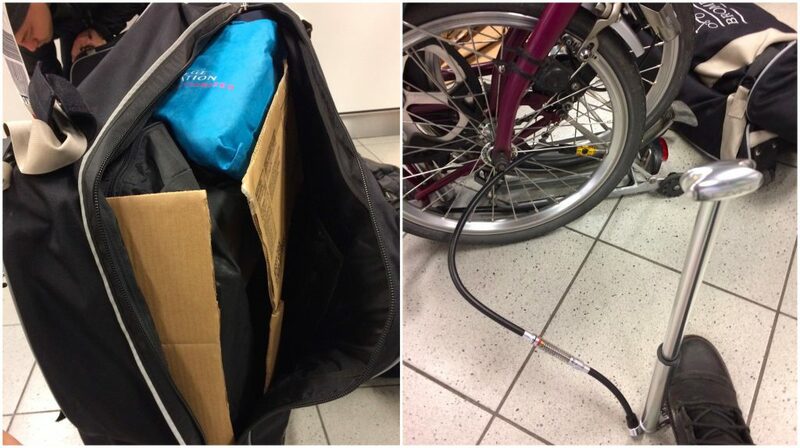 Again, despite putting Pier’s Brompton in the Oversized luggage, it came out in the regular luggage along with mine. 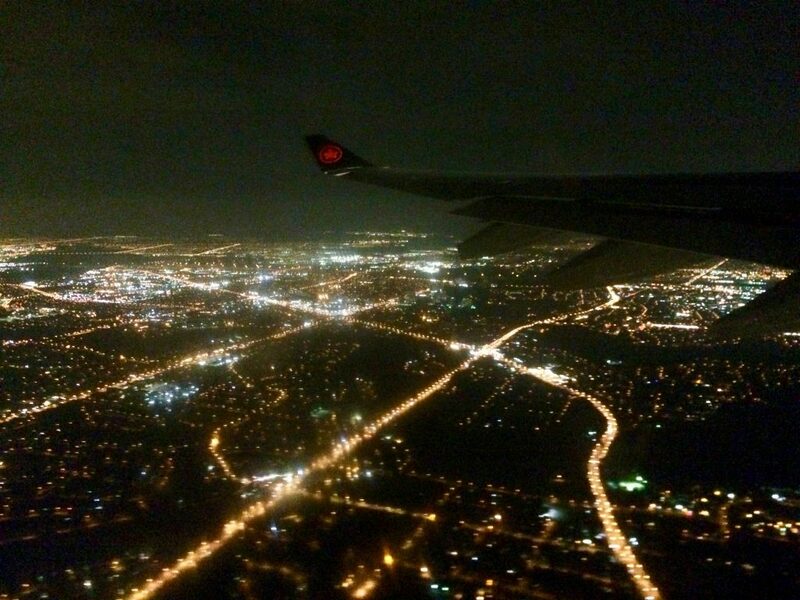 Overall, flying Air Canada with the Bromptons was a good experience. Though the official policy is to charge $100 for bikes, the employees we encountered were willing to waive that fee since our Bromptons fold down to standard luggage size. Thank you for sharing your experience! 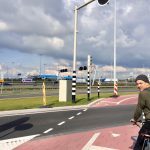 I purposely took Air Transat to France with my Brompton last summer because I didn’t want to deal with Air Canada’s outrageous bike fees… But I ended up having to pay Air Transat’s (much cheaper) bike fee on the way there anyway. Good to know that AC can be a bit flexible especially if they can’t tell its a bike! You’re welcome! 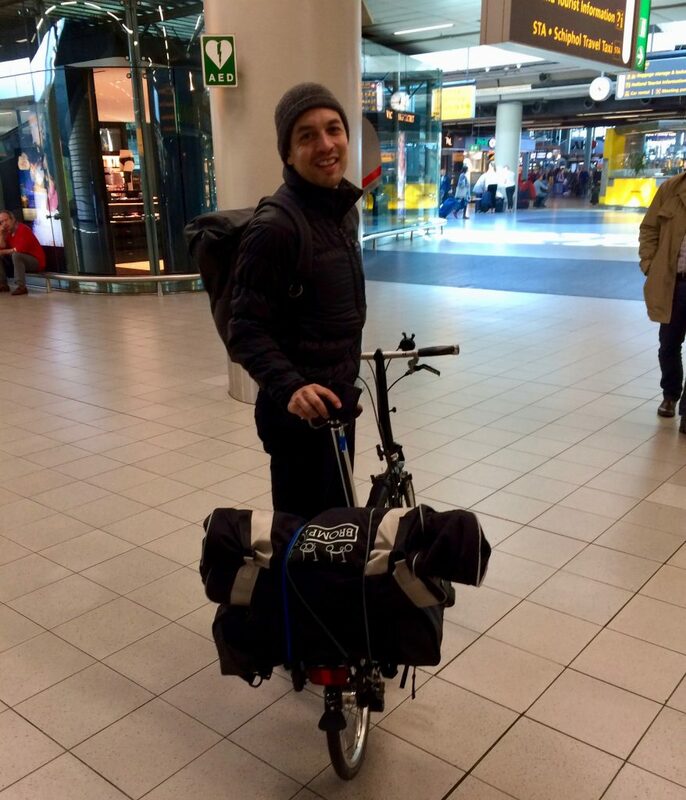 Flying with Bromptons is one of the things I researched like crazy before our first trip (and still research), so we’re happy to share our experience.